Skylum Software is releasing the much talked about photo editing tool, Luminar 3 on Dec. 18, 2018. Luminar 3 is an all-in-one photo app designed to offers everything a modern photographer needs for photo editing. That sounds great, but what makes this version special is Skylum has added the number one most requested feature from users; the ability to organize and view their images. This added feature is a game changer for experienced users looking for an alternative to their current editing tools and it’s a simple solution for photographers just starting out. Before I get into the new features of Luminar 3, I want to point out a few hidden benefits that make learning Luminar simple. Like many, my first image editing tool was Photoshop. I had a love/hate relationship. I loved the results, I hated the time it took to learn the advanced tool. Luminar has built-in learning tools that make it easy to learn. Clicking the information icon in the Filters catalog, then selecting a filter, will explain the purpose of the filter. If you would rather learn by watching a video, select Video Tutorials from the Help menu to be directed to Luminar’s education section on the web. Skylum is always adding new content to the education site, helping user’s become fast, efficient and creative at photo editing. 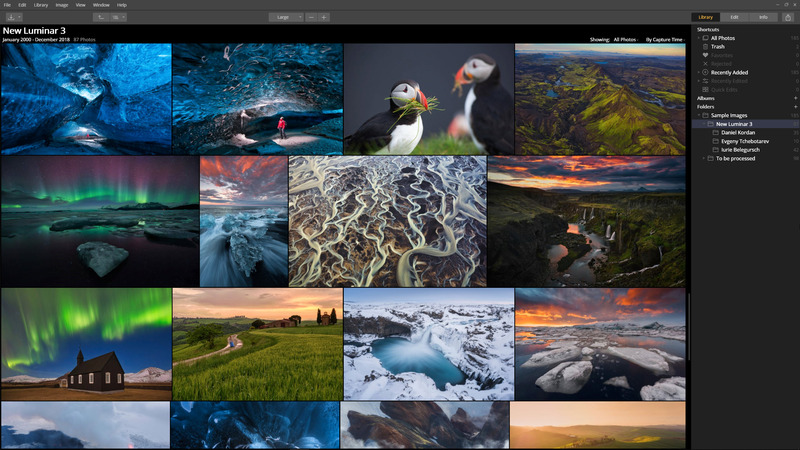 A Luminar Library creates a catalog of your images so you can conveniently browse, rate, or group your photos. With Luminar 3 your photos are the center of attention. A beautiful interface offers a sleek canvas to enjoy all your images without extra distractions. Automatically group your photos by year, month and even day. Easily navigate between images and make sure that the perfect image you’re looking for is always at hand. Give all your photos the look you want in seconds. Make the necessary edits on a single image. And instantly sync all the adjustments with a click. Here is an overview of all the new and improved features of Luminar. Photo editing is a personal process for many. People spend years building the perfect workflow. Luminar offers the ability to radically speed up the editing process and boost creativity…but doesn’t destroy your existing workflow. Use your existing storage and folder organization. Luminar works with the images and folders you’ve already organized. Broad format support means you can use most RAW and DNG files as well as popular formats like TIFF, JPEG and PNG. You can even create Photoshop and PDF files. Color precision makes accurate adjustments possible. Under the hood, Luminar uses a broad color space and 16-bit editing for the most accurate color and flexibility. Advanced color profile support works on Mac and Windows to accurately display colors on your monitor. Bring your Photoshop style plugins with you and use them inside Luminar. Run Luminar as a plugin for Photoshop, Lightroom Classic, Apple Aperture and Photos for Mac. It also works as an external editor for tools like Capture One. Any photographer can add the benefits of Luminar to their editing workflow. Each license can be installed on up to five machines owned by the same family or person. Luminar works great on both Windows and Mac computers. Use Luminar as a plugin for Photoshop, Lightroom Classic, Photoshop Elements, Aperture and Photos for Mac. Free video education and webinars are included with your purchase. The software never expires and is subscription-free. Skylum ships multiple free updates to each version that offer new features and increased format support. Customers can upgrade to new versions at a deep discount. The new Luminar 3 will be available as a free update for all the users of Luminar 2018 on Dec. 18, 2018 and will include multiple free updates as they built out a fuller set of photo management tools and more time saving artificial intelligence features. More information about future updates is available at https://skylum.com/luminar/roadmap. As you can see, I’m very excited about the new version of Luminar not just because I’m the newest member of their educational development team but as an end user myself. I love the addition of Libraries. This added feature means I can now rely on Luminar 3 to be my sole digital darkroom to view, organize and edit my images and use Photoshop as it was meant to be; a graphics editor to create my movie posters and complex photo manipulation. You can purchase Luminar 2018 and get the free update for just $59. Click here to learn more.